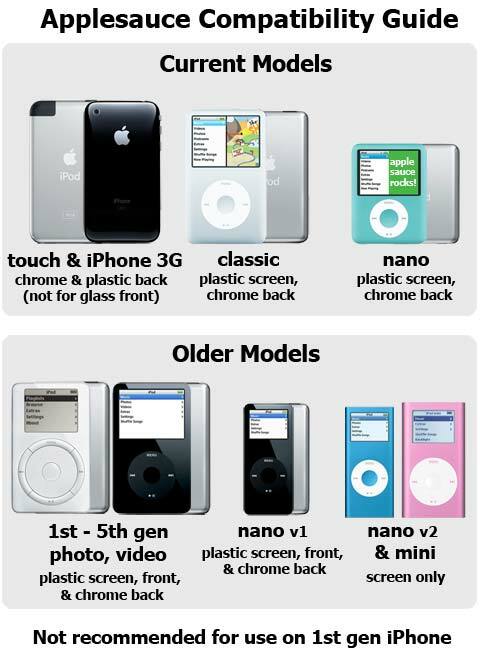 The instructions and tips illustrated in this tutorial can be used for all models of iPod - See compability chart below. Shake Polish well. Wipe area to be polished with clean cloth. Fold cloth in half several times. Apply single drop of Polish to polishing cloth. Always use light,even pressure. Avoid pressing on, or getting excess Polish around the click wheel. Use a back and forth motion, until the polish has been absorbed. It will typically take a minimum of 3-5, 60 second applications before moving on to the next step. Be sure to wipe all traces of Polish clean before proceeding. Inspect iPod surface. Fine scratches and swirls may be visible and will be removed with the application of Glaze. Shake Glaze well. Apply a single drop of Glaze to a NEW polishing cloth. Apply as before in 60-second intervals. Repeat as necessary until majority of scratches and swirls have been removed. Use a clean section of cloth to gently wipe most of the Glaze off, leaving a thin film. Use the final clean cloth with a circular motion and as little pressure as possible to remove glaze. 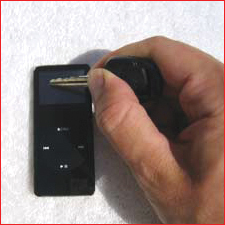 Tip: The key to a swirl-free finish, especially on black iPods, is to use very little pressure with a clean cloth. Check surface for imperfections. If swirls or fine scratches remain, reapply Glaze. If deeper scratches remain, begin process again with Polish. Can I use Applesauce on my iPod? See compability chart for information regarding your device. Can I use Applesauce on the chrome back of my iPod? Yes. However, the chrome finish on iPod's is extremely easy to scratch, and restoring it to its factory state almost impossible. Applesauce's Polish is useful for removing grime, fingerprints and light scratches. Excessive polishing of the iPod's metal back is not recommended. The scratches aren't coming out. Now what? Keep trying. Virtually any scratch can be removed or vastly improved with patience. Increase pressure slightly and rub quickly back and forth for 30-60 seconds. Work only on a small area at a time (1 inch square, or the size of a quarter). Reapply polish to cloth and repeat. Avoid pressing too hard on sensitive areas of your device (clickwheel or display for example). Keep in mind that the the Polish may leave fine scratches and will require multiple applications of the Glaze to restore the original shine. Will Applesauce work on my...? Applesauce smells good. Can I eat it? NO, Applesauce Polish is not edible. Keep out of reach of children.